Once you start wearing bracelets you’ll never take them off. One at a time is sleek and sophisticated more worn together will give you that stylish boho chic look. 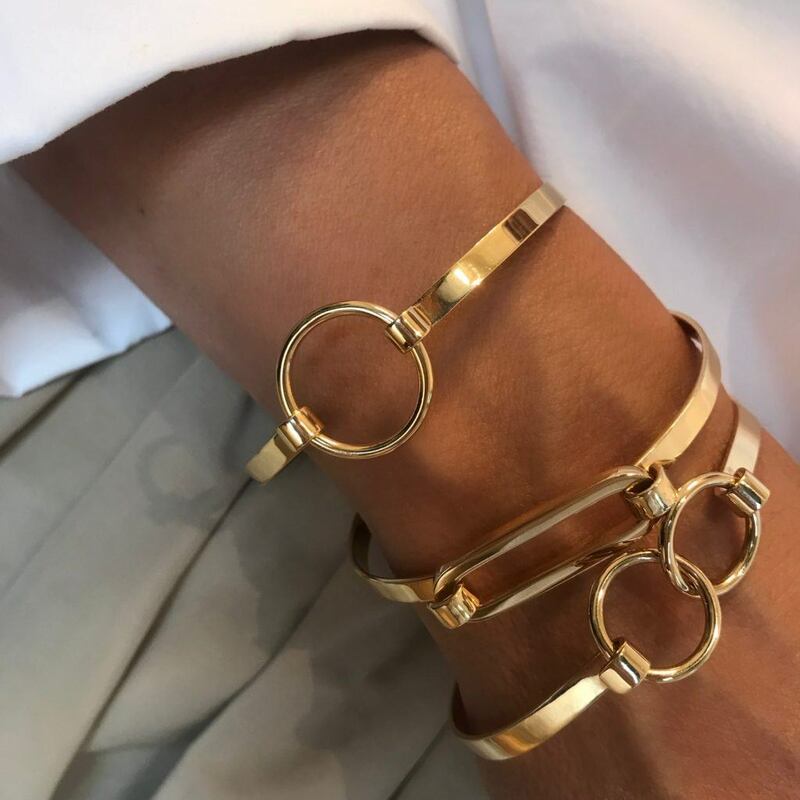 We love stacking and mixing braclets and bangles together, but let us give you a few pointers to remember when shopping for braclets and bangles. First of all be aware of the size you choose. 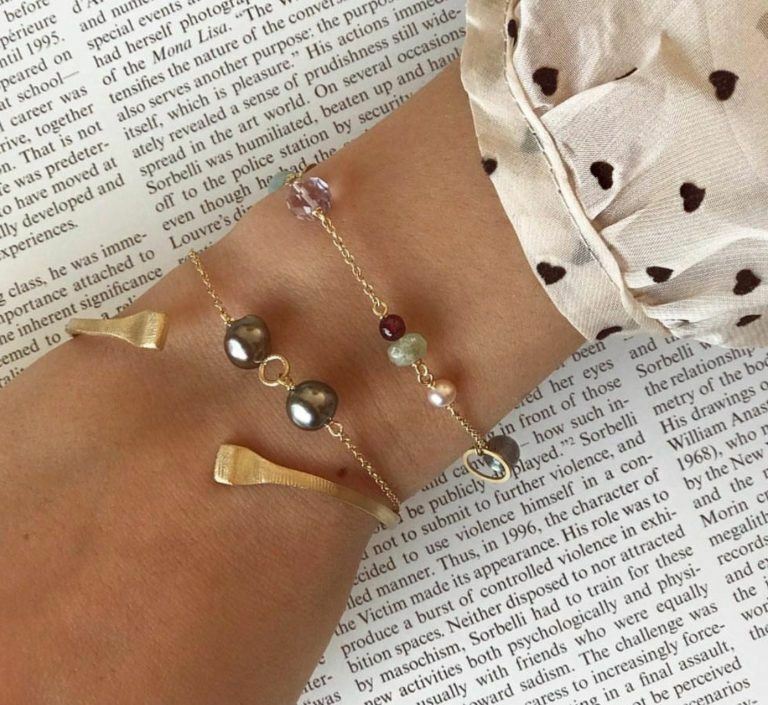 Chain bracelets with charms can be tricky as the charms can weigh a lot and pull the bracelet downward. So make sure the size isn’t too small or too big or choose charms that are light weight. Bangles, which are fixed bracelets are super classy and stunning to mix with chain bracelets. 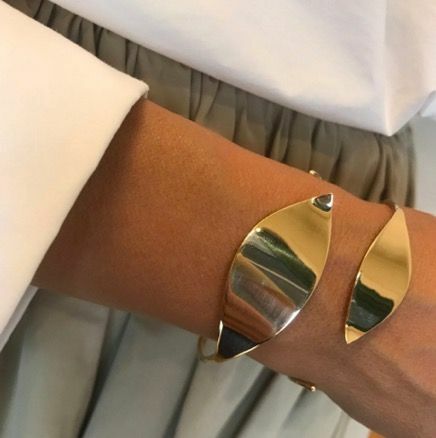 Open bangles such as the Olive bangle from Rebekka Notkin or Nature bangles from Ole Lynggaard Copenhagen with a stone or a detail are comfortable for every day. 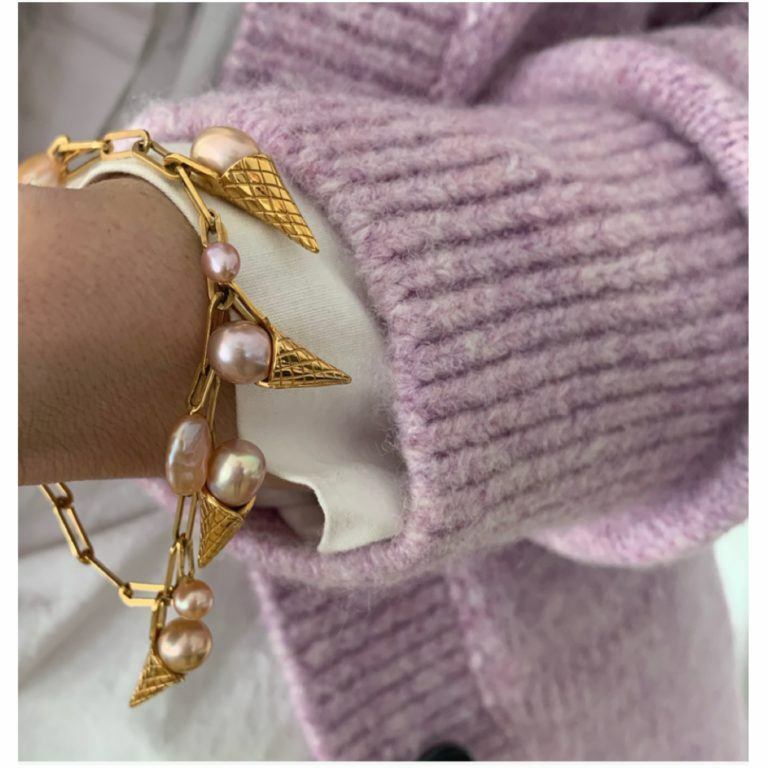 Bangles with a clasp such as Kharisma Bangle from Dulong Jewellery are super wearable because they fit your arm perfectly. Bracelets are those jewellery items you should never take, which also addresses the importance of buying a high quality material so you can eat, sleep and drink with it without it being torn. 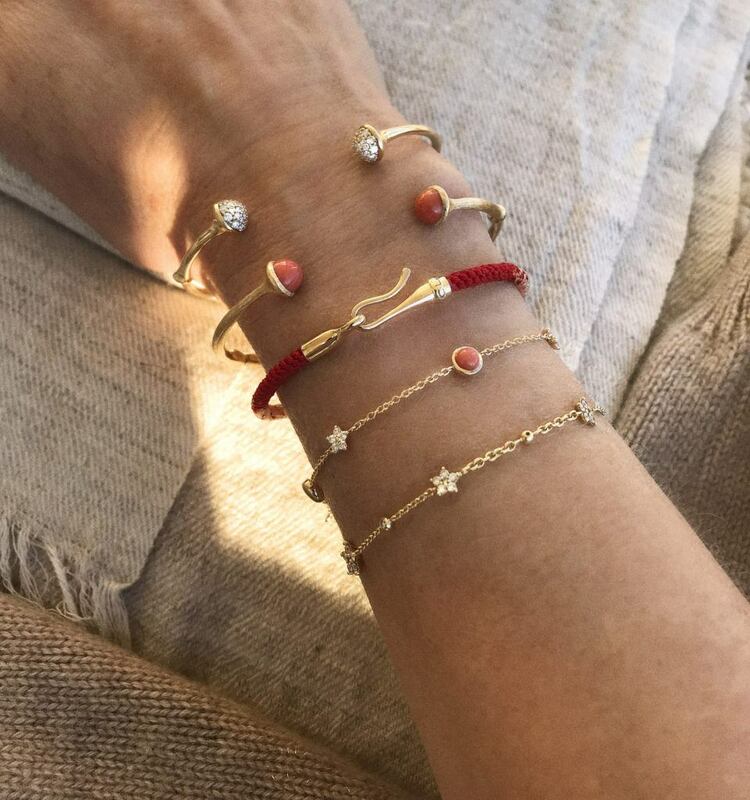 A stunning bracelet can be realized only when you get complimented on a unique one that you are wearing. This Olive bracelet made into a gold petal at one end is very trendy and falls in the contemporary look of jewelry. This is something you can pair with a modern dress of either very dark colors or plain white. It is something that adds grace to your entire look! The Life Bohemian Spirit is a very cool trend these days. It is a very colourful and powerful bracelets, which is great for giving extra character for your jewellery style. Because of the multiple colours it can be paried with any other jewellery to spark up your jewellery game and give a modern look. 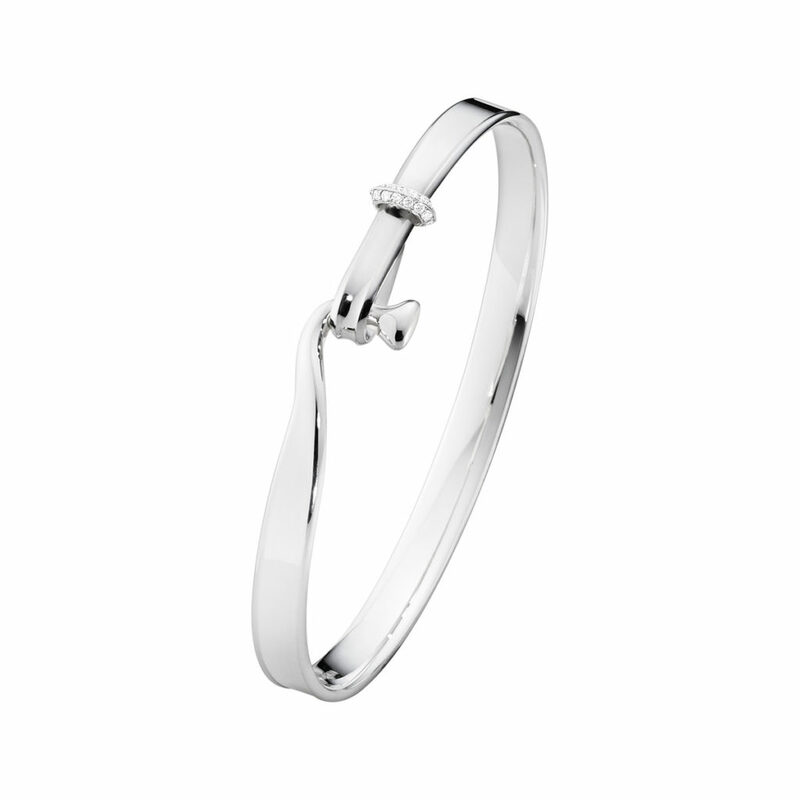 This Torun Bangle makes your wrist look very petite and give you a sense of feminine beauty. It is suited for every day wear and formal events events. It can be paired with white pearl earrings which will make and iconic duo for your perfect look! Present Oval Diamond from Rebekka Notkin is a go-to bracelet which you can wear on daily to your job or college. This gives off a stylish appearance with all the diamonds and remains to be clean because of the simple gold chain.